We are excited to release new features for both our HRIS and Benefits Administration modules. Additionally, we have made a few enhancements for our Broker partners in our latest product release. Please read on to find out more and as always, we welcome your feedback and suggestions. This product release comes with the ability to simplify your benefits enrollment in Flock. The new design gives you a landscape view of the available benefits for simplified elections on one screen vs the old, vertical view. Additionally, the UI no longer truncates plans between screens. Now all plans are shown in their entirety. We have updated Flock’s HRIS UI (Admin Portal) to give it a fresh and modern design. Get quick access to adding new offers and employees, requesting time-off, accessing profiles, settings and more right on your home screen -- making it easier for admins and employees to navigate through the different tabs in the Flock platform. Admins now have the ability to create Custom Folders and group related, specific documents in one folder. Additionally, you can now move the existing documents in Flock to your newly created folders as shown in the below screenshots. Flock’s Benefits Administration functionality is now extended and accessible to your custom role. The Custom role you create can now administer benefits for any assigned group of employees in the company. We have also added functionality for the Custom Role to have controlled access to each of the reporting sections as well as the employees they can report on. Your location admin can now run custom reports limited to the permitted employees and their permitted data fields. 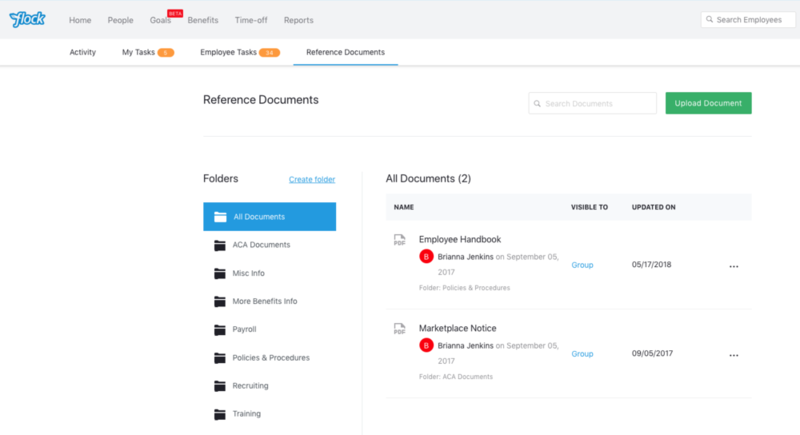 Flock’s April product update comes with a feature to customize the employee directory. From email to manager’s name - you can now hide/show the fields pertaining to your employees’ profiles. Not using the job category to sort your employees, but would like to view by Employee ID? Simply select the columns you would like to see under the Settings->People section. We have provided a means to Search with an additional dropdown on your client’s page. Now you can search for employee name, email, and SSN to navigate directly to the employee’s profile page. Don’t know the employees email? Simply type in a sub-string of their name or any consecutive four digits to see which employee’s match the data. This also works across the employee’s dependents as well. Many self-billed clients require a report that breaks out billing by tier or age-bands. With Flock’s new self-bill report, you can run this report with a single click of a button. The report will show the number of lives enrolled within each tier or age-band as well as the volume, rate and total cost. We are making several more changes to make the carrier billing process much simpler to manage. Stay tuned! Note: this is not currently available for age-banded medical plans. In-case you missed our January 21, 2018, release, please click here.